Use the Zoom box to enter text and expressions in tight places, such as a property sheet or Query Design view. You can resize the Zoom box and change the font. And the Zoom box remembers the size and font each time you use it. 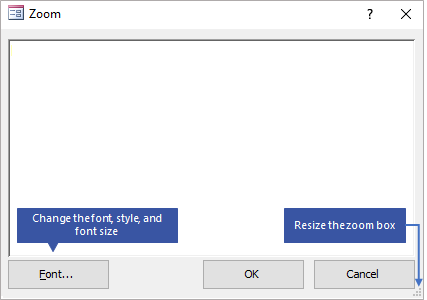 Resizing the Zoom box is available to Office 365 Subscribers only. Need help with expressions? For more information, see Use Access expressions. Position the insertion point in a text box, such as in a property box or in the query design grid. Right click the text box and select Zoom, or press Shift+F2. To format by using the Mini toolbar, select the text and then click an option on the toolbar. The Mini toolbar only displays when the field is set with the Text Format property value of Rich Text.